Set in an idyllic village named Avalon, a warm and wonderful new novel from Ireland’s #1 bestselling author. #1 international bestselling author Cathy Kelly’s writing is “warm, lyrical, and fascinating” (Marian Keyes) and “rich with the emerald allure of the Irish landscape” (Publishers Weekly). 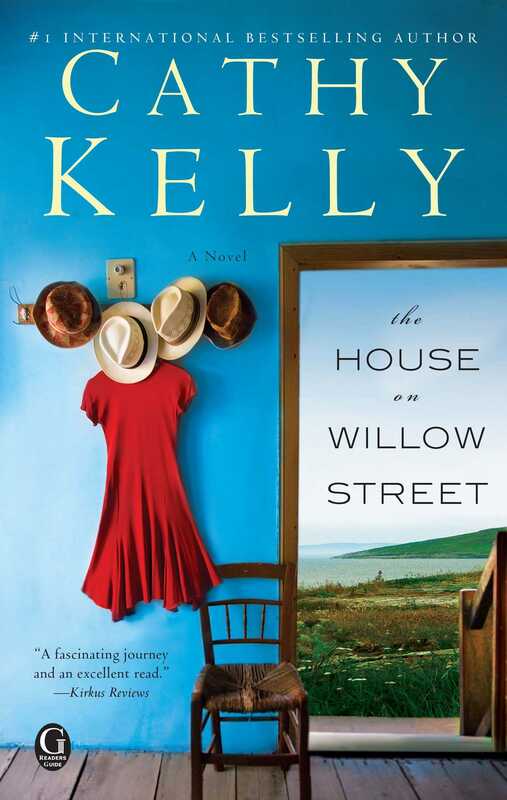 In The House on Willow Street, four women discover that home isn’t where you come from, but where you are meant to be. . . .
Every picture-perfect village tells a story. . . . The Irish seaside town of Avalon is a tourist’s dream of quaint shops and welcoming cafés. Avalon House, perched at the end of Willow Street, was in Tess Power’s family for generations. Now Tess ekes out a living from her antiques shop while the crumbling mansion awaits a new owner. Her marriage and business may be floundering, but her affection for Avalon is undimmed. The same can’t be said of her glamorous sister. Suki left without a backward glance and married into an American political dynasty. Only a muckraking biographer could send her slinking back to Ireland to escape a scandal. Postmistress Danae watches from the sidelines, doling out gentle advice while locking away her own secrets. Then her unconventional niece Mara comes to stay and draws her lonely aunt back into the world. As autumn gives way to winter, the four women encounter old loves, embrace new friendships, and begin to look beyond the past to the possibilities just beginning to unfold. This reading group guide for The House on Willow Street includes an introduction, discussion questions, and ideas for enhancing your book club. The suggested questions are intended to help your reading group find new and interesting angles and topics for your discussion. We hope that these ideas will enrich your conversation and increase your enjoyment of the book. Tess Power is shocked to discover her world crumbling around her. Newly separated from her husband and on the verge of bankruptcy, her pain only deepens when her former fiancé and first love suddenly returns and buys her beloved childhood home. Set in the Irish coastal town of Avalon, The House on Willow Street tells Tess’s story, as well as the story of three other women—Suki, Danae and Mara—all of whom must come to terms with their past in order to understand their future. 1. The novel opens with Danae as the narrator. Musing on the thunderstorm, Danae thinks: “People who’d never felt the pure darkness of life itself were scared when night fell. People who understood the darkness knew that lack of light wasn’t the problem.” (pg. 13) Do you think that darkness and the inevitable pain of living are central to Danae’s philosophy on life? If so, why? 2. Discuss the ways in which Tess’s shop—Something Old— demonstrates her desire to hold onto the past. What people, events, or memories do you think Tess wants to keep close? Is “something old” more important to Tess than “something new”? 3. Consider the relationship of the Power sisters Tess and Suki. How are they alike? How are they different? Is there a bond that holds them together besides their blood? 4. The novel is divided according to season. In what ways do the different seasons inform the story? In what ways does the setting inform the story? “Perhaps it wasn’t the place that was the problem but the time of year” (pg. 70), Danae muses to herself. In your opinion, what has a more powerful effect on the characters—the season or the town? 5. All of the female characters embody a type of feminist theory that is slightly different from the others. Do you think Suki, the self-proclaimed feminist, is the strongest female character? Why or what not? Would you classify Danae as a feminist? Mara? Tess? 6. Do you think that Danae made the right decision regarding Antonio? Would you have done the same thing in her place? Why or why not? 7. Answer the question that Suki poses to herself on page 120: “Smart women didn’t look back, they looked forward. Right?” Do you think this is true, or is there something to be gained from looking back at ones own past? Consider Suki, Tess, Mara, and Danae in your response. 8. The House on Willow Street has many characters. Ultimately, whose story is this? Is there one character you could name as the heroine? 9. Discuss Cashel’s character. What role does he play in the story? Do you like him? How does his anger change throughout the course of the story? Does the purchase of Avalon House symbolize change for Cashel? How so? 10. “Thanks to Mara and her magic, this had been the first Christmas that Dane hadn’t spent tormented by the guilt of knowing that Antonio would never be able to participate in the seasonal celebration . . . and now Danae was being punished. Punished for casting aside all thought of her husband for a few days.” (pg. 383) How does guilt inform Danae’s character? Do you think guilt impacts any other character? Why? 11. Revisit the scene at Antonio’s funeral on page 441. Discuss the ways in which this is a pivotal moment in the story. Do you think that Adriana’s forgiveness changed Danae’s life? 12. “There was merely Avalon House, a beautiful house that was never going to be his home because he had no one to share it with.” (pg. 468) Discuss the ending of the story in light of this quote. What are you thoughts on the ending? 1. On page 113, Suki asks: “Though the glass ceiling remained, no one seemed interested. Feminist writers had devoted entire books to topics such as body image, sexuality, the power of motherhood, and what difference had it made?” In light of this question, have your book club read The Feminine Mystique (1963) by Betty Friedan. Consider the ways in which the characters do or do not live up to the examples set out in Friedan’s book. In your own expereince, do you think it is true that womens lives have not changed much since the advent of feminism? Do you think women’s lives are “like hamster wheels, endlessly turning” (pg. 386)? Share your responses with your book club members. 2. Ireland and Irish culture play a large role in this novel. Like Danae, explore Celtic myths and traditions. What information can you find out about the role of myth in Irish culture? What connections can you draw between the myths of the country and the myths in the novel? 3. The House on Willow Street touches on the topic of domestic abuse. Danae, the victim of abuse, continues to be a controlled by her husband and her guilt over his brain injury years after he has been put in a long-term care facility. Host a movie night with your book club and watch the 2002 movie Enough starring Jennifer Lopez. How does Danae differ from Jennifer’s character? Is she similar in any way? In your opinion, which character handled her situation better? Would you have made the same decisions in their positions? Why or why not? The House on Willow Street is beautifully written. I could almost hear the wind howling through the trees and the people chatting in the local cafe. I thoroughly enjoyed every minute and look forward to reading Cathy Kelly's other books. A novel for and about women, a tapestry woven of romance and mystery, secrets kept and revealed, hearts broken and mended, dreams shattered and realized as destinies are rediscovered. The author begins by taking the reader on a tour of the small town of Avalon on the Irish Coast, introducing her cast of characters, hinting at their secrets, letting them question, surprise and ultimately support one another. Danae, the postmistress, is kind and discreet, careful not to pry too much into the private lives of the people she serves, knowing from personal experience that some things are just too hard to talk about. Her niece Mara leaves small-town life for a career in the big city only to return to nurse a broken heart. Tess remains home to care for her dying father, marries, has two children and runs an antiques business. When her marriage to Kevin grows bland, she suggests a trial separation to see if absence will make their hearts grow fonder. Tess’ older sister Suki left home as soon as she could, seeking a bigger pond, and when her marriage into a famous, wealthy American family ended, she embarked upon an affair with a famous rock star. Additionally, she made a name for herself as the author of a best-selling feminist work titled Women and Their Wars. By the time we meet her, Suki is alone, broke and dealing with writer’s block. She is also running from a scandalmonger seeking information about the famous family she was once a part of and decides to hide out with her sister back home. The characters, with all their detailed idiosyncrasies, are authentically portrayed, and the peregrinations of the complex plot make for a fascinating journey and an excellent read. "A book for those who believe in love." As postmistress of the tiny Irish town of Avalon, Danae Rahill knows a lot of secrets. She has managed to keep the secret of her own past for 18 years, but when her niece Mara comes to stay (and heal from a broken heart), she asks more questions than Danae is prepared to answer. Tess Power grew up in genteel poverty with her sister, Suki, in a big house overlooking the town, but was forced to sell it after her father's death. Now, as Tess's marriage and her antique shop both face difficulties, the house has come back up for sale. When Suki returns to Avalon, as does Tess's first love, Cashel Reilly, now a wealthy businessman, Tess must revisit painful memories from her past even as she struggles to care for her children and help Suki navigate her own personal crisis. Kelly creates a charming small-town setting, complete with a cozy café, nosy but well-meaning shopkeepers and neighbors, and not one but two faithful dogs. While the central love story unfolds predictably, other surprises in the narrative (including a cheery motorcycle mechanic and a Christmas dinner party composed of unlikely guests) will hold readers' interest. The slowly unraveling secret of Danae's past lends gravity to an otherwise light plot, providing more reasons to admire her quiet strength. A tribute to family, friendship and the hope of new beginnings, The House at Willow Street is a heartwarming read perfect for a quiet winter weekend. Discover: A heartwarming story of four women in a tiny Irish town, navigating personal crossroads and embracing the hope of new beginnings.